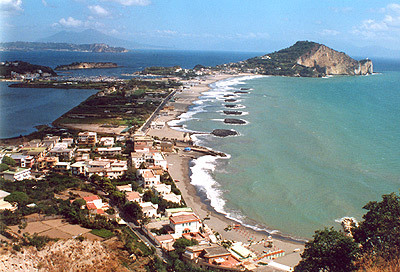 In the middle of Pozzuoli's Gulf there is Baia, once the nicest and richest resort of the Roman Empire. Situated in a bizarre volcanic scenario, its beauty was soon caught by Julius Cesar and Augustus who established here there residences and followed later on by Nerone, Caligola, Lucullo and many more. Baia became a land of gardens and luxurious residences built by the most innovative building techniques. Baia and Miseno, one aside of the other had strong connections at that time. While Baia was an Emperors resort, Miseno was the base of one of the strongest roman fleet, that found easy and safe harbours in the volcanic lakes just behind. But the myth keeps for Baia a more ancient birth being the burial place of Greek hero Baios, Ulisse's friend. Abandoned during all Middle Ages, its myth was still alive for the Grand Tour Travellers of the XVIIIth century and it remained a sort of out of time land until the new urbanization of the XXth. Still now it's impossible not to be taken away by the fascination of the places. The visit touches Lago Lucrino and Lago D'Averno with the Apollo's Temple, the Diana's Temple, the Imperial Villa of Baia, the Archaeological Museum of Miseno Castle, the gorgeous Piscina Mirabilis, the beach of Capo Miseno and the Pharo. We do like to remember that the territory of Baia went down about 6 m during the centuries creating the Underwater Archeological Park where it's possible to admire with a normal dive the rests of the noble Roman villas, a unique show in the world: of the ancient port, today submerged, it's possible to see 12 columns at a minimum depth.